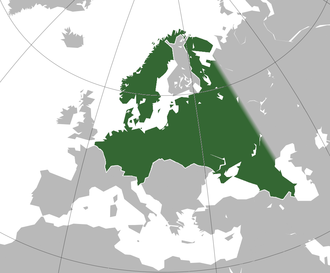 The Greater Germanic Reich, to be realised with the policies of Lebensraum, had boundaries derived from the plans of the Generalplan Ost, the state administration, and the Schutzstaffel (SS). ↑ "Utopia: The 'Greater Germanic Reich of the German Nation'". München - Berlin: Institut für Zeitgeschichte. 1999. ↑ Allan Bullock & Stephen Trombley, ed. "Lebensraum." The New Fontana Dictionary of Modern Thought (1999), p. 473. ↑ 3.0 3.1 André Mineau (2004). Operation Barbarossa: Ideology and Ethics Against Human Dignity. Rodopi. p. 180. ISBN 9042016337 – โดยทาง Google Books. ↑ 4.0 4.1 4.2 4.3 Shelley Baranowski (2011). Nazi Empire: German Colonialism and Imperialism from Bismarck to Hitler. Cambridge University Press. p. 141. ISBN 0521857392 – โดยทาง Google Books. ↑ Jeremy Noakes (March 30, 2011). "BBC – History – World Wars: Hitler and Lebensraum in the East". ↑ Mark Mazower (2013) . Hitler's Empire: Nazi Rule in Occupied Europe. Penguin UK. p. 431. ISBN 0141917504 – โดยทาง Google Books. Hitler, Adolf (March 21, 1939). Mein Kampf. Introduction by James Vincent Murphy, the Irish translator of Mein Kampf who worked in Goebbels's Ministry of Propaganda from 1934 to 1938 (died 1946). Hurst and Blackett. The copy contains both, Volume 1: A Retrospect, and Volume 2: The national Socialist Movement, fully unexpurgated; in text file format without pagination. Reprinted in 1939 (before the US entered the war) by Houghton Mifflin, Boston Massachusetts. This book is still banned from publication in Germany – via Project Gutenberg Australia. Note: The term 'Lebensraum', as loan-word adopted in the English historiography long after World War II ended, does not appear in the first prewar translation of the original. [Also:] Mein Kampf by Adolf Hitler (DjVu). Introduction by John Chamberlain et al. Reynal A Hitchcock; published by arrangement with Houghton Mifflin Company. 1941. Paginated, Complete and Unabridged – via Internet Archive. [And:] Mein Kampf. Houghton Mifflin. 1971. ISBN 978-0-395-07801-3. [As well as:] Hitler, Adolf (2016). Mein Kampf. Adolf Hitler. ISBN 6050418349 – via Google Books. หน้านี้แก้ไขล่าสุดเมื่อวันที่ 12 ตุลาคม 2561 เวลา 03:24 น.